There really is nothing quite like cooking the perfect omelette to start the day. Golden brown on the outside, slightly creamy inside, some melted cheese within…a masterfully done omelette truly is a pleasure to behold. And eat. When you take your omelettes seriously, you know that the right omelette pan is vitally important to their creation. Just any old frying pan won’t do; you need something with the right material, the right quality of non-stick surface, and a strong, thick handle that allows you to maneuver and wield the pan exactly as you need. For these reasons there are actually specially-designed omelette pans! If you’re looking for the perfect omelette pan for your kitchen, check out our roundup below and see which is the right one for you. When choosing the right omelette pan for your purposes, there are a few things you ought to keep an eye out for, to make sure you get the right one for you and your purposes. Smoothly, gently-sloping edges in a pan makes it easier to move the omelette across the pan smoothly and make it easier to pick it up and flip with the spatula. They also make it easier to slide the omelette out of the pan and onto an awaiting plate when it’s done. Nothing is worse than eggs that stick to the pan and having that happen would ruin your omelette almost instantaneously. That’s why non-stick pans were invented. 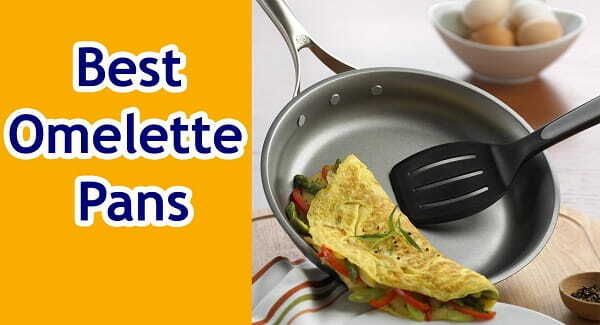 A high-quality, non-stick finish will ensure your omelette flips easily and slides right out when you’re done. It might seem counterintuitive, but a proper cooking pan is thick, even and flat. This allows the heat to distribute and radiate evenly across the pan, transfers it to the omelette more efficiently, and results in an evenly-cooked omelette. A thin, cheap pan will likely warp over time, and can result in burned food. An omelette pan’s handle is equally important as it’s cooking surface. You want the handle to be firm and solid enough to hold to and maneuver the pan while flipping the omelette. Preferably, it’s covered in a material that doesn’t get too hot, so you can grab it confidently whenever. (If it’s not, be sure to use a silicone or fabric pot holder). Wood’s a nice choice, but isn’t dishwasher-safe; neither are many rubbers or plastics. Consider the number of people you used to cook for. Is it for just one or making a bigger omelet for several people? For singles, 8” pans are good, while it is better to choose 10” to 12” pans to accommodate your guests or family. However, making the perfect omelet is difficult in bigger pans. What About the Material? Stainless Steel, Aluminum Cast Iron, Carbon Steel, Etc. Last, but certainly not least, pay attention to the material the pan is made of. 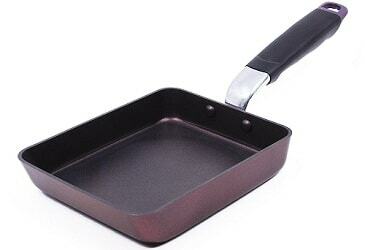 Most omelettete pans will be made of stainless steel or anodized aluminum, with or without non-stick coating. Higher-end models will be cast-iron or carbon steel, which are very similar in their properties and both create an excellently-cooked omelette. All four materials have their own pluses and minuses. Stainless steel is non-reactive and good for cooking virtually anything but doesn’t transfer heat well. Aluminum conducts heat evenly and transfers that heat the food but extremely well, but can react with acidic foods (safe, but affects flavor) and can warp at high heats. Anodized aluminum improves upon raw aluminum, as it’s been hardened to withstand higher heats, radiate heat more evenly, and not react with foods. Carbon steel isn’t as popular as some of these other pan materials, but it’s one of the most popular pan materials used by chef’s all over. A steel and carbon alloy, it has excellent heat transfer and conductivity, searing just like cast-iron does while being lighter and wieldier. It needs to be seasoned, like cast-iron, but is then practically non-stick. To Coat or Not To Coat? Is A Non-Stick Pan A Good Idea For An Omelette Pan? Non-stick surfaces are actually kind of a polarizing issue; some chefs swear by them, while others swear to never use them again. They have also garnered lots of controversy and debate thanks to the chemicals used to give them that non-stick coating. They often contain PFOA’s and other unsavory things many people don’t want in their food. If you’re set against non-stick pans, there are excellent choices out there to choose from. But the best omelette pans usually have some kind of non-stick coating to make flipping the omelette and sliding it out of the pan easy, and ensure you’re not scraping egg off when you should be eating. Read to read some reviews? Here’s our picks for the Best Omelettete Pans of 2019. See also my review for the Best Cast Iron Skillet Pan. If you don’t mind dropping some cash on an excellent frying pan, this All-Clad stainless-steel model is for you. 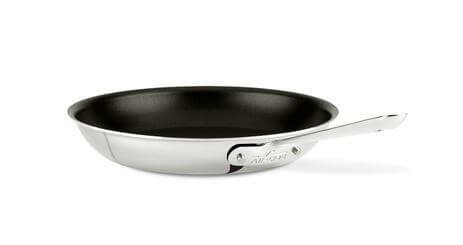 All-Clad is known for their heavy-duty pieces of cookware that often last decades, and this pan is no exception. It has a 3-ply bonded construction, made of stainless steel with an aluminum core, which allows for even, consistent cooking without hot spots and makes for a seriously-durable pan. It also has three layers of PFOA-free nonstick coating, so your eggs don’t stick (and neither does anything else). It works with virtually any cooking surface whether that’s a gas or electric stove, induction cooker or even the oven, and can be stuck right in the dishwasher when clean. The long, professional-style stainless steel handle is stuck on there with rivets and makes for a comfortable grip. It’s also all made in the USA. There a few complaints, to be fair. First, it’s expensive. Second, despite All-Clad’s legendary bombproof construction, the non-stick coating is…not very good. It’s reported to flake and peel off over time, a disappointment for a pan this expensive – and otherwise this nice. Still, it’s a quality pan and if you have the money to spend, worth it in our opinion. Extremely high-quality. Robust build. All-Clad Guarantee. Designed specifically for omelettes and frittatas, this Nordic Ware pan is made of pure aluminum, paired with heavy-duty stainless-steel handles. The two-part design is engineered to make cooking omelettes and frittatas easier, either by allowing you to saute the fillings on one half before flipping the other half and combining it with the eggs, or by cooking eggs on both sides and simply closing the pan, creating a perfectly-flipped, two-sided omelet. Easy. It has a non-stick coating to ensure nothing sticks and to make cleanup much easier, and the aluminum surface – while not as hard or thick as anodized aluminum – radiates heat evenly. It’s made in the USA and backed up by a 10-year warranty. Cooking options besides omelettes are limited. When it comes to cookware of any kind, it really doesn’t get much better than Calphalon. This frying pan is no exception. Made from a heavy-gauge anodized aluminum, it’s a durable pan that will last years of use and heavy cooking, with a thick bottom that conducts heat well and transfers it evenly for perfectly-cooked foods. The tall sides with rounded, gently-sloping edges are ideal for flipping and tossing omelettes, and it has three layers of PFOA-free, non-stick coating for a long-lasting, smooth finish. Furthermore, it’s dishwasher-safe, as well as oven-safe up to 450 degrees. A double-riveted stainless-steel handle means it’s durable and built to last; it’s also backed up by a full lifetime warranty. Heavy-gauge anodized aluminum is durable and built to last. Thick Anodized aluminum conducts and radiates heat evenly. Gently sloping edges are good for flipping. 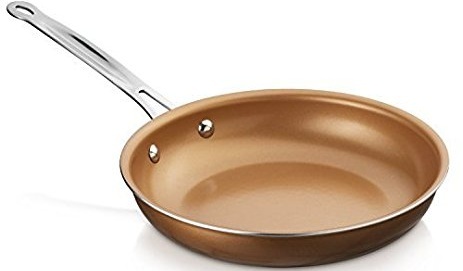 If you’d like something with the classic good looks and durability that copper provides, the Cooksmark Non-Stick Frying Pan is an excellent choice. It features a heavy-duty, thick copper construction, with an aluminum core for better heat distribution as well as a bottom specifically designed for compatibility with induction cooking surfaces. It’s very conductive of heat and allows for even, smooth cooking. This is paired with a triple-layer, non-stick interior that is free of PFOA’s, cadmium and lead, and is also dishwasher-safe. The Cooksmark’s gently-sloping sides are perfect for cooking and flipping omelettes, and the sturdy stainless-steel handle makes it wieldy and easy to use. Finally, it’s oven-safe up to 450 degrees, as well as dishwasher safe. It’s also very inexpensive. Our one complaint, however, is that it tends to scratch easily, on both the non-stick surface and the bottom. If durability matters to you, this might not be your first choice. Copper build with aluminum core for better heat distribution. 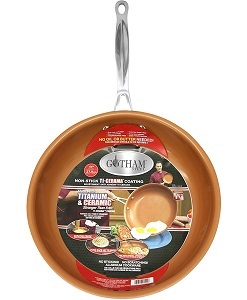 The Gotham Steel Non-Stick Titanium Frying Pan is another decent omelette pan for not a whole lot of money. 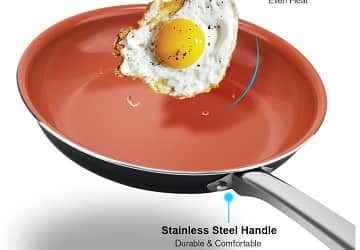 It’s made of what they call Ti-Cerama, a ceramic reinforced with titanium that’s supposed to give a smooth, even, durable cooking surface, and is coated with a non-stick surface free of PTHE, PFOA and PFOS for a safe and non-toxic cooking surface where eggs and omelettes just slide right off. It’s oven safe up to 500F, as well as dishwasher safe, and is easy to clean – but that’s about where the fun ends. The quality and durability simply isn’t there, and over time food will start to stick, the non-stick coating starts to flake, and some people have even reported that the stainless steel handle breaks off! It’s inexpensive, and the Ti-Cerama coating is decent, but there are better options out there for the same price. 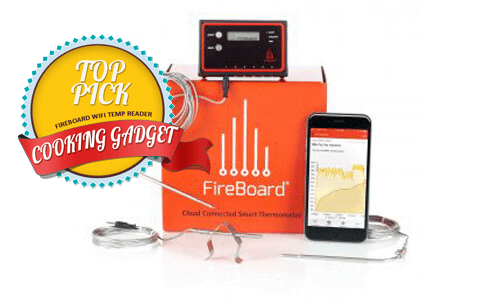 Non-stick coating is PTHE, PFOA and PFOS-free. The Calphalon Non-Stick is another inexpensive offering from Calphalon for an omelette pan, with a medium-gauge, hard-anodized aluminum build and cooking surface that is flat, smooth and easy to use. It has a 2-coat, proprietary non-stick surface that is non-reactive and safe for temperatures up to 400 degrees, so you can stick it in the oven; it’s also safe for cooking with on virtually any cooking surface. Since it’s meant for omelette’s, Calphalon gave it low, gently-sloping sides for easy flipping and sliding. You can also throw on a lid for cooking and simmering foods besides eggs, the silicone handle stays cool and comfortable, Calphalon includes a 10 Year Warranty. Our only complaint is that the medium-gauge aluminum is not as thick and durable as other options; it often warps at high temperatures. We still prefer a heavy-gauge stainless steel or iron. This specialized pan is designed for tamagoyaki, a kind of Japanese rolled omelet made by rolling several thin layers of cooked egg together. This requires a special pan shape – rectangular or squared – as opposed to rounded. The edges on this TeChef pan are very slightly sloped to make for easier rolling. The pan itself is made from a durable aluminum, paired with a stainless-steel bottom. This results in a thicker, stronger pan that distributes heat more evenly and is ready for cooking on induction top cookers. The non-stick coating is PFOA, Cadmium and Lead-free for a safe cooking experience. Our major complaints with the TeChef, however, are that it’s not dishwasher-safe (would be very welcome), and that the handle gets very hot on the stove, despite its rubber handle. Aluminum pan with stainless steel bottom. Gets hot and cooks evenly. 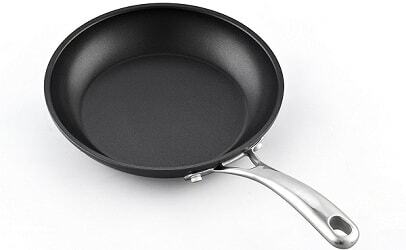 Non-stick surface free of PFOA’s, Cadmium, Lead, etc. 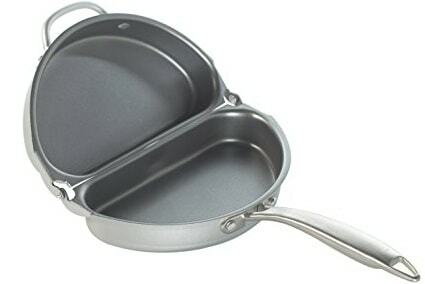 Nothing fancy here, just a reliable, high-quality pan from German manufacturer Deik. Made with hardened, anodized aluminum, it’s got a smooth cooking surface and a durable build that can be used on any cooking surface (stove, electric, induction) and is dishwasher safe. The non-stick coating is treated with titanium to make it harder and last even longer. To make cooking easier and more comfortable, Deik also gave the pan a CoolTouch silicone handle that won’t heat up if left over the heat and is even oven-safe. Finally, the wide cooking are and gentle sides and lips are perfect for omelettes. Our only complaint is that you can’t use metal cooking utensils without scratching the protective coating. Otherwise, it’s pretty inexpensive and a good budget choice. Metal utensil can be harmful. Needs only wooden or silicone one. Cooking with hard shell can harm its body. Using wire ball to wash scratches the coating. 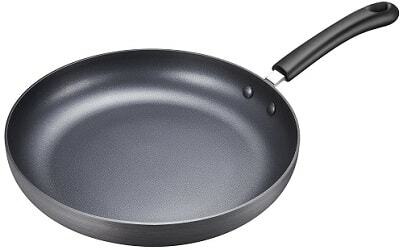 Last but not least, the Hommate 12” Non-Stick Frying Pan. It’s built from an aluminum body, giving it decent heat transfer and strength, but features a titanium-reinforced ceramic non-stick coating, free of all the harmful chemicals you don’t want in your food. The edges are sloped especially for cooking eggs, it makes for an overall easy cooking experience. 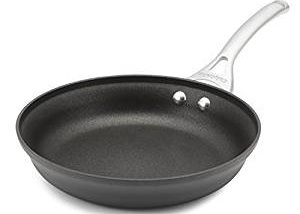 Being constructed of aluminum allows the Hommate to be lighter and wieldier than most other frying pans; paired with a double-riveted stainless-steel handle and this is a sturdy, wieldy pan for not a lot of money. In fact, our only major complaint is that the stainless steel handle gets very hot over the stove. For the price, however, this is another excellent omelette pan. 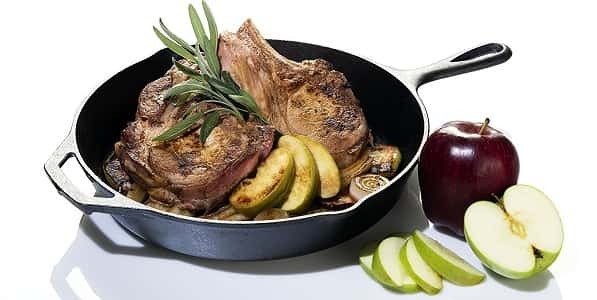 Much like theCalphalon Non-Stick Pan above, but even more inexpensive, the Cooks Standard Fry Pan is also made from a durable, hardened anodized aluminum – and is likewise built to last. It’s thick, though not incredibly so, harder than stainless steel, and heats evenly without creating hotspots. The design is perfect for omelettes, with a flat, wide bottom complemented by a smooth, tapered lip for rolling the omelettes of the pan. 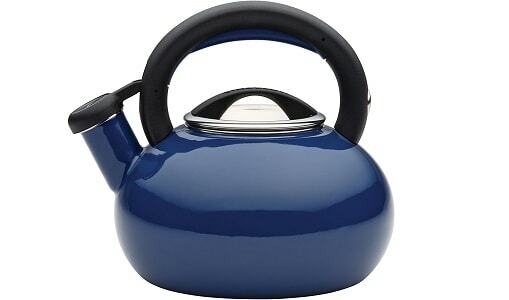 The stainless-steel handle is long enough to stay cool on most burners and is riveted for extra durability. Lastly, it’s coated with a non-stick surface free of lead, cadmium and PFOA’s, among other harmful chemicals, and you can use it on most cooking surfaces – gas, electric, glass – but not induction. It’s also not dishwasher safe, which might knock it down a peg. How to Clean a Burnt Omelette Pan? Pour water at the base of the pan and add vinegar to it. Now you can use your spoon or any other utensil that is readily available in the kitchen to clean the pan from the accumulated food particles and the burnt pan. If there are certain stains that shall not come out due to the burn, you need to add just some baking powder along with a few drops of water and leave it for some time. The burn will loosen up post a few minutes and you shall be able to clean the omelette pan. -You can add a mixture of vinegar and water in the pan. Boil the same and keep it for around 15-20 minutes. This will result in the loosening of the food particles that might have accumulated at the base of the pan due to the burning. After removing the food, you should scrub the pan using soap and a scrubber. -similarly, if you have made omelette in a pan made of stainless steel, you need to boil water in the pan for around 15 to 20 minutes. With the help of a spoon, the particles of the omelette that might have accumulated at the base of the pan need to be removed. Post that, take a scrubber and a cloth and wash the pan suing a liquid soap or a bar soap.You can use vinegar for extremely ditty stains that shall otherwise not go away using the normal process. – Another good option is to use diet coke. You can pour the diet coke in the pan and try to reduce it by boiling it. When the same has been reduced, the sugar shall help to loosen up any food particles and in the process, you can clean the pot. Thus, next time when you have a burnt omelette pan, do not simply throw it away. Use the above methods to clean your pan and save on money, time, and effort. Irrespective of the fact that Japanese technology has all the bells and whistles to make cooking omelet a child’s play, we would still recommend the timeless and classic omelet pan, which is none other than Calphalon Contemporary Anodized-Aluminum Nonstick Cookware. It is indeed the best omelet pan money can buy. Though you need to wash it by hand, there is no major flaw in its design and functionality. It has got everything you have ever desired in an omelet pan, i.e. from 3-layer non-stick coating, sloped edges, even distribution of heat, and safe handle. 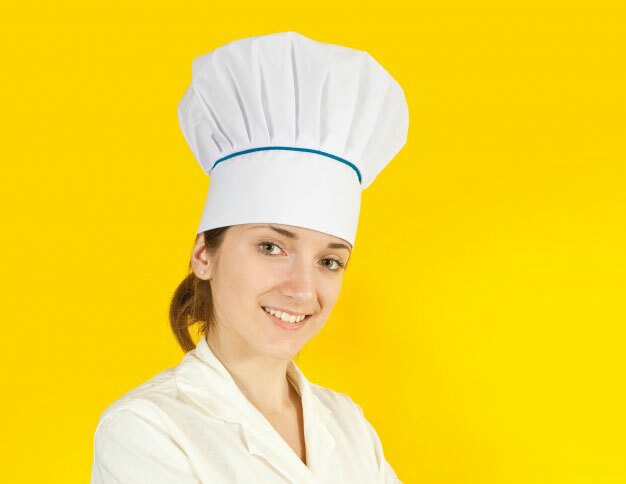 You can easily prepare a well-cooked omelet even though you have average skills in cooking.